I subscribe to several of Hoffman Media’s publications: TeaTime, The Cottage Journal, Southern Lady, and Celebrate (sadly, no longer in publication). These are wonderful publications that have gorgeous pictures, inspiring stories and fabulous recipes and menus. I am also a fan of Martha Stewart, so I gather inspiration from a variety of fronts. 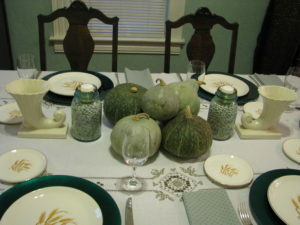 I had noticed some greenish/greyish/bluish squash in the grocery store for a few years and also in pictures of groupings of gourds in these magazines, so I thought it would be neat to break out of the traditional autumnal color palette and design a table around this beautifully colored squash. I thought the result was wonderful! I found the squash at IGA and used two antique blue canning jars as candleholders, filling each with Great Northern beans (later used for Boston baked beans) and inserting a perfectly-fitting clear glass votive candleholder at the top of each jar. Ivory cornucopia vases I had purchased at the Conrad Mansion during its now-ceased Christmas at the Mansion Gala flanked the canning jars to form the centerpiece. Homer Laughlin’s Golden Wheat china, the Official Thanksgiving China of The Sisters, was placed on teal green chargers from Michael’s crafts store, and of course Great Grandma Mayer’s Coronation flatware was used on the Thanksgiving table. Wine goblets from West Germany rounded out the covers. The Lucke tablecloth was put back into service along with napkins I had made from fabric that took an hour to find at Ben Franklin’s in Havre. I was trying to find something that would compliment the squash, and I finally found one bolt of fabric that would fit the bill!